Simple, Secure and Fast - Excel to Tally Converter tool. Import any Excel Voucher or Master data to Tally through - Excel to Tally Converter tool. 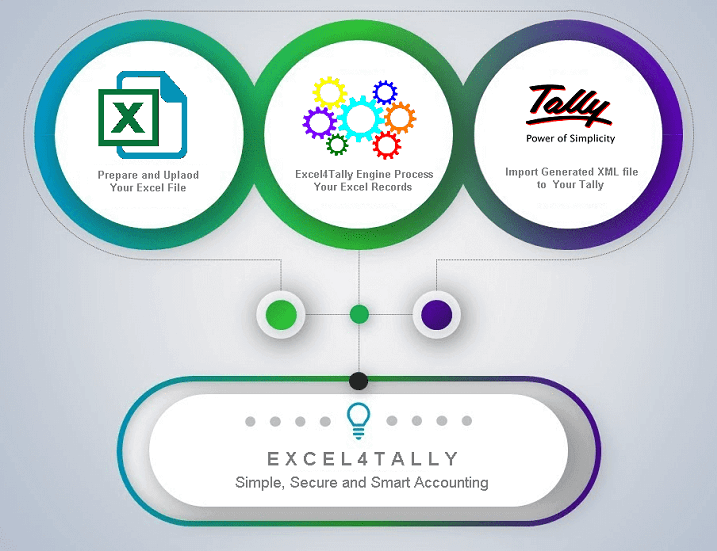 Try Free Excel to Tally Converter, Just few clicks and your excel data imported to Tally ERP successfully. We are software lover and wanted to provide cloud Excel to Tally import tool to every Tally User. ₹ 259 per Month & ₹ 2590 per Year per Voucher. Simple, Secure & Smart Accounting - First Choice of Tally User. Excel Data to Tally ERP 9 - Choose What You Need. Easy and user friendly Excel to Tally Converter design help you to achieve your task with less time and more accurately. Built with a user friendly interface, Excel to Tally tool can be used on a PC, Mac and even a tablet. If you’re in your office or travelling on the go, easily check status. Work with your team in real time and each team member can only access specific secition of Excel to Tally tool. Save Manual data Entry time, Reduce mistakes, One Click and data ready in Tally ERP. Excel to Tally Converter has been built according to the latest security standards of our industry. We don't store your transactional data. It's done on real time basis. Safe and Secure. Register and Start your Free trial for Excel to Tally Tool, Excel4Tally Software. We will love to hear from you, Please feel free to reach us for Excel to Tally Converter demo.